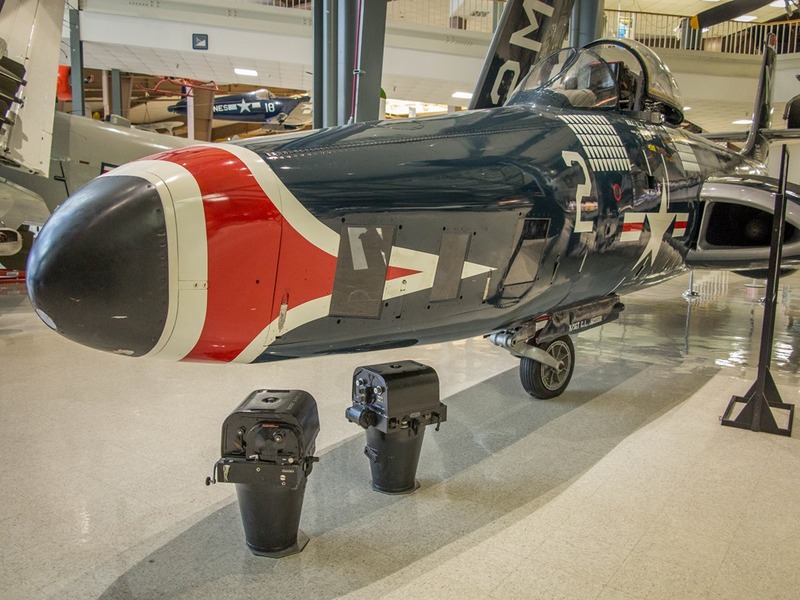 As a former Navy photographer’s mate, the big aerial cameras under the long, windowed nose of the dark blue straight-wing jet drew me to the McDonnell F2H-2P photo Banshee. 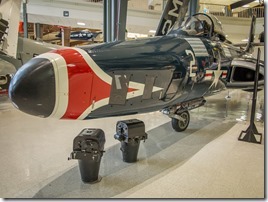 It was the Navy’s first photoreconnaissance jet. And the airplane on display was the last example, the sole survivor. But that’s not what got my attention. The explanatory placard said that this airplane, its wing and fuselage filled with concrete, after a barge ride down the Indian River in 1959, spent nearly 30 years as a kiddie-climber at Pocahontas Park in Vero Beach, Florida. 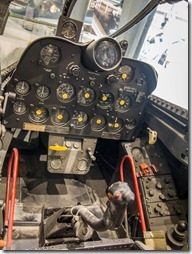 The National Museum of Naval Aviation didn’t acquire the airplane until 1988! And then it spent thousands of hours chipping out the concrete and carefully piecing the airplane back together using period parts. Top dead center of the panel is the pilot’s viewfinder. He used it to sight his subject and to rotate the cameras from the vertical (straight down) to horizontal (oblique) positions. At night, two under-wing stores carried 20 flash bombs. With its electric heat, the windows in the camera bay did not frost up at altitude. And it could get up there. 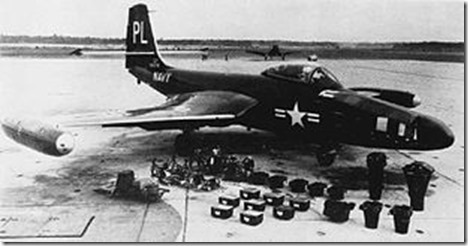 The long-legged (1,475 miles) jet had a maximum operational ceiling of 48,500 feet, and its speed (535 mph at 10,000 feet) made it a hard target for other Korean-era jets to catch. The successor to its FH Phantom, McDonnell produced 364 F2Hs Banshees. Of that number, McDonnell stretched the noses of 89 of them 2-feet-5-inches to make room for six reconnaissance cameras, including the K-38. This offered superior performance and safety over the other photo bird serving the naval aviation during Korea, the F9F-2P Panther. 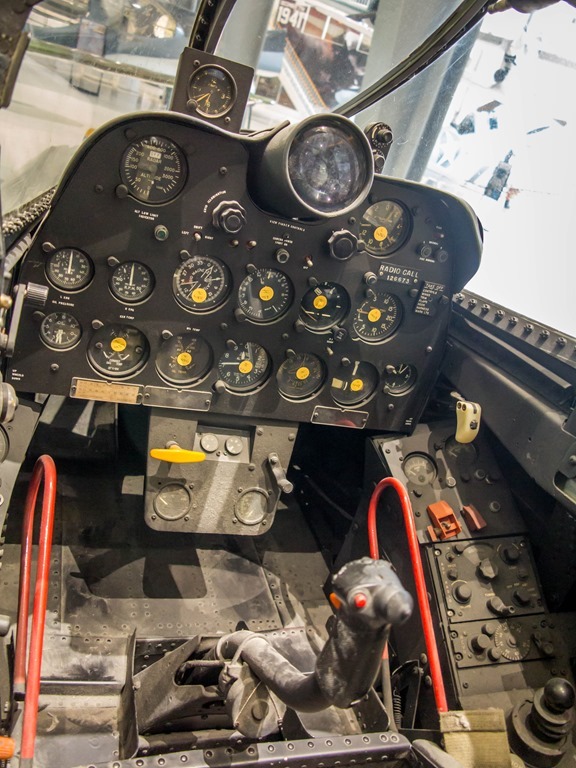 With its K-38s, the Banshee could capture in one pass at 15,000 feet what took three passes at 5,000 feet in the Panther with its K-17 cameras. After the Korean War, the Navy retired, then scrapped, all of the photo Banshees, except the sole survivor. Curious to find out how this jet survived, I dove, unsuccessfully, into the Internet’s research labyrinth. I thought I’d found the key when I learned that the Vero Beach Regional Airport was a naval air station during World War II. But as far as I could learn, the F2H-2P photo Banshee was never stationed there. Local business leaders built the Vero Beach Regional Airport in 1929. Shortly after Pearl Harbor, the Navy drafted the airport and bought the 1,500 acres that surrounded it. 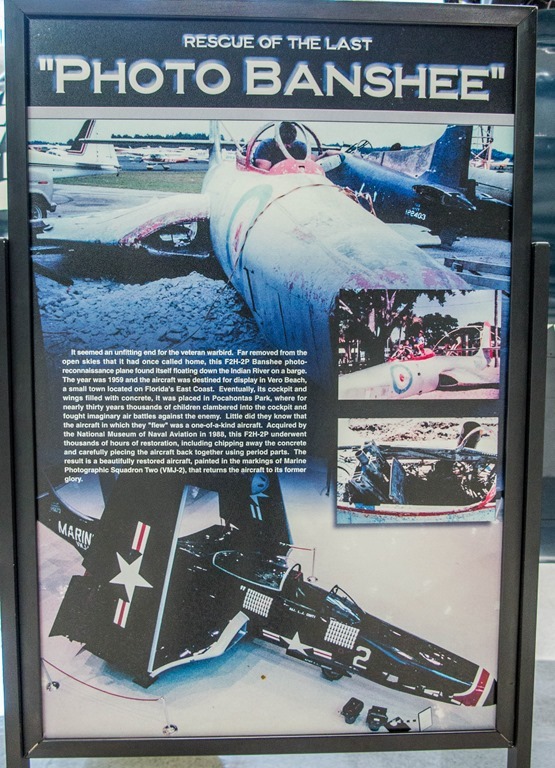 Commissioned at NAS Vero Beach in 1942, new naval aviators learned to fly the SB2A Buccaneer scout bomber there. In 1944, NAS Vero Beach’s training mission turned to night fighters, the F6F Hellcat and F7F Tigercat. Over this time, other nearby airports were enlisted in the war effort. 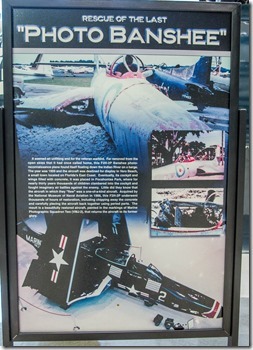 Stuart’s Witham Field was designated as an auxiliary air station in support of NAS Vero, and Sebastian/Roseland and Fort Pierce served as outlying landing fields. This entry was posted on Monday, November 19th, 2018 at 8:00 am	and is filed under Airports, Aviation Education, Aviation History, Education, General, Military. You can follow any responses to this entry through the RSS 2.0 feed. Both comments and pings are currently closed.